Let’s get this straight: ‘Alienation’ doesn’t really do anything you won’t have heard before. However, what it does, it does extremely well, to the point where you can hear the love for the riffs and the spacier elements creeping through almost every note. ‘Help Me’ introduces things in style with a riff that takes a staple Sabbath sound, dresses it further with the kind of fuzzy stoner that made Black Moth‘s second album so appealing and then drives it home with some fantastically heavy drumming. Within a few bars, Pink Cocoon marks a place within the stoner and doom pantheon and that’s before we get to the vocals… Rather than kill the groove with a devastating growl, Zolla opts for an often more preferable mumble, giving things a particularly atmospheric bent. It’s a style that adds to the riff rather than forcing a fight for dominance. Of particular note, though, is the number’s extended guitar solo which uses effects and phasers to create a multi-layered sound; a sound which really enhances the furious bluesy howl. After several bars of drone and feedback suggesting a space rock freakout is just around the bend, ‘No Control’ pushes the drums forth for a slightly angrier workout. Zolla’s sense of rhythm is exemplary as he sets up a groove that’s very much inspired by Sabbath’s ‘Children of the Grave’, while his echoing vocal gives everything a definite leaning towards classic Monster Magnet. It’s rather simplistic, but that doesn’t detract from the power of the groove: the guitar tones are superb; the slightly detached vocal is cool and – for older rock fans – the main hook shows a little love for the mighty UFO. As before, everything builds to a fiery solo that’s surprisingly succinct, but Zolla’s tone is so appealing, the solos could take up far more of this release and it would still be fantastic. A doomy and off-kilter waltz, ‘Old Lady At The Window’ has the core of something that would suit Zakk Wylde’s Black Label Society. This is reinforced by the presence of stretched vocal melodies and a desire to drag things out beyond a natural playing time. The move further towards straight stoner blues renders it not as interesting in some ways, but once again, a forceful guitar tone ensures there’s plenty for fans of classic metal styles to enjoy, while usage of reverbed sounds during a quiet section wins out with some really unsettling atmospherics. Almost feeling like two numbers glued together, things take a quick about turn nearing the five minute mark, allowing everything to explode into a much faster riff, where those previously dominant drums come across with immense power. 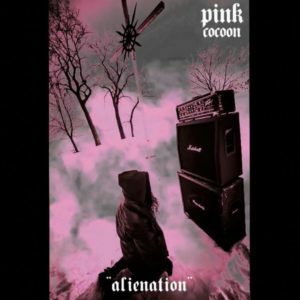 It mightn’t be Pink Cocoon’s best track, all things considered, but the scale alone of ‘Old Lady’ should win over lovers of a such classically retro heaviness. ‘Someone Is Out There’, meanwhile, exposes the DIY origins of the recording, fading in unnaturally in a way that makes it feel as if the listener is intruding upon a live studio jam. In a change of fortunes, the drums are a tad lumpen, but everything else – at least in stoner terms – is top drawer, especially extensive use of fuzz pedals to give the main riffs a powerful and raw buzz. Vocally, Zolla adopts a rockier voice to avoid getting swamped by the massive tsunami riff…and everything works out well. Overall, it’s a really solid offering. An intro using delay pedals and a cleaner guitar tone, ‘A New Beginning’ presents a minute’s worth of echoes and pulses before the joyously named ‘Child of Death’ closes this set with a heavy blues/stoner jam that takes cues from Monster Magnet, France’s Missing Mile and Orange Goblin. The vocal could have been pulled from Hawkwind’s ‘Space Ritual’ and as such is one of ‘Alienation’s best, but this number is all about the guitar riff, especially by the halfway stage when a cocky groove bows down to some slower sludge, which combined with a heavy use of effects for a superbly bass fuzzy solo, results in one of the release’s best moments. Had this been recorded by the power trio Zolla calls upon for live performances, this would be a great record. As it is, with the one man band set up, it’s still a great record. Quite often with overdubbed solo projects, there’s a tendency for the instrumentation to not have a natural groove or feel. ‘Alienation’ really doesn’t suffer that drawback – everything here sounds like a natural band jam. The songs – if indeed you could call them songs rather than a collection of massive riffs and atmospheres – are some of the best, stylistically, since Death Metal Pope dropped their ‘Harvest’ EP at the end of 2016. If you like a riff…and especially one that comes from a very heavy Hawkwind headspace, then you need to seek out this release immediately. This entry was posted in Album & EP Reviews and tagged canada, doom metal, metal, pink cocoon, stoner, stream by Real Gone. Bookmark the permalink.